JPMorgan retained its place at the top of the global investment bank rankings in the first half of this year despite a fall in revenues, while Deutsche Bank's troubles ensured the top five were all U.S. banks, new data on Friday showed. 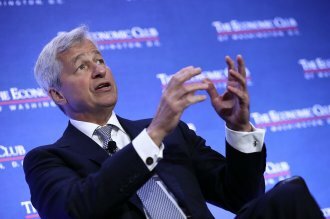 JPMorgan's (jpm) revenue from trading, mergers and acquisitions and other investment banking activity was $12.5 billion in the six months to June, down 5.3% from the same period a year ago, according to data compiled by industry analytics firm Coalition. Deutsche (db) has warned it may need deeper cost cuts to turn itself around after revenue fell sharply in the second quarter due to challenging markets and low interest rates. It fell to sixth place from third, allowing Bank of America Merrill Lynch to move up into the top five. Investment banks suffered their worst first half year performance since the 2008 financial crisis as revenues for the top 12 players fell 15% from the same period a year ago, the data showed. Looming U.S. elections, Britain's vote to leave the European Union in June, near-zero interest rates and worries about China's economy have spooked markets this year and curbed investors' appetite to take risks. Last week, Citigroup (c) said it expects to post better results in fixed income trading for the third quarter compared with a year ago. Most of JPMorgan's revenue, some $6.9 billion, was accrued on its home turf but the $3.9 billion generated in its Europe, Middle East and Africa (EMEA) operations was enough to dislodge Deutsche from the top place in that region. In the same period last year, Deutsche was number one in EMEA with revenue of $4.3 billion. Its slide to number two, even on its home turf highlights how difficult a year it has been for Germany's biggest lender. JPMorgan also dislodged Deutsche Bank in the Asia Pacific (APAC region) to take top spot with revenue of $1.7 billion in the first half of the year. That was 15% lower than the $2 billion Deutsche Bank earned in the same period last year in the region. JPMorgan retained its crown in fixed income, currencies and commodities (FICC) trading, its position solidified by its dominance in G10 rates and foreign exchange trading. The U.S. bank slipped a place to third in the equities ranking, however.